A landmark in Lisbon, Portugal, Village Underground's unique workspace champions creativity. But how might it influence your office design? Despite that fact that it’s a coworking hub, from the outside, Lisbon, Portugal’s Village Underground looks about as far removed from an office as it’s possible to get. Consisting of 14 shipping containers stacked haphazardly on top of one another – each of which is a workspace for creative start-ups and projects – and a double decker bus whose seats have been repurposed into desks and benches for coworking, Village Underground is a unique workspace. 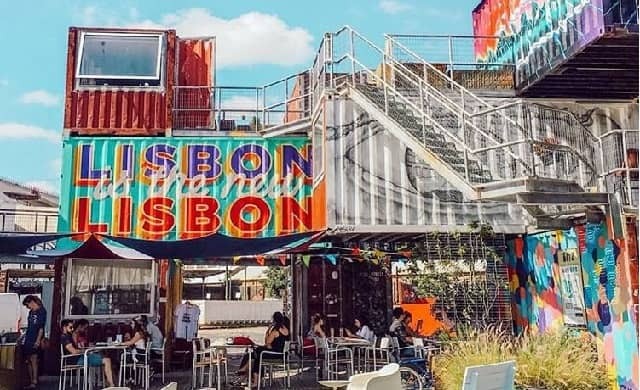 While disused shipping containers may sound somewhat dull and industrial, the fact that they have been painted in an array of colours and patterns by some of Lisbon’s top street artists means the space does truly reflect its status as a hub for vibrant creatives. At its core, Village Underground has a focus on community, and nurturing independent projects that may not have excessive resources – but nonetheless are working creatively towards ambitious goals. This spirit is reflected in the fact that the seeming mundanity of shipping containers and buses has been so creatively repurposed into something useful and enjoyable. As a certified creative incubator space, Village Underground offers an event space, workshops, exhibitions, a conference room and a recording studio to its start-up and entrepreneurial clients. Considered a landmark on the streets of Lisbon, the site is also open to the public – with a cafe and restaurant, bar, skatepark, live entertainment venue, and a space for small independent businesses to sell their products on the premises. With its focus on fostering Lisbon’s creative independent businesses – as well projects within the local music and arts scene – Village Underground has fostered a truly creative space where entrepreneurs are encouraged to think outside of the box. Taking office design inspiration from Village Underground is all about repurposing supposedly useless items into attractive or useful design features. Try to find items that you no longer have a use for, and have them decorated or redesigned. As well as creating unique pieces, as a start-up owner one major benefit of this is that you’ll also save yourself money by engaging in a little DIY rather than buying all-new decor. And it doesn’t have to stop at decorations – you might also decide to upcycle old furniture. Think reupholstering, spray painting – whatever you think will improve them for office use. This doesn’t have to be something you work on on your own – you can also encourage collaboration among your staff by making it a team project, asking them to bring in any potentially useful items or materials they might have going to waste at home. In doing this well, you’ll end up with an office that is truly unique and that your team, if they’ve helped to decorate it, can feel proud of. Of course, there is a risk that you might come across as cheap in asking your staff to bring in their own things – so be sure to outline why this will be a fun and useful project. You should also make sure you don’t scrimp on comfortable office chairs and desks; it may be best to buy those new.